Maybe it was a combination of the right time, places, circumstances, and people on our trip? Maybe it's just Cuba, it has a way of getting under your skin! 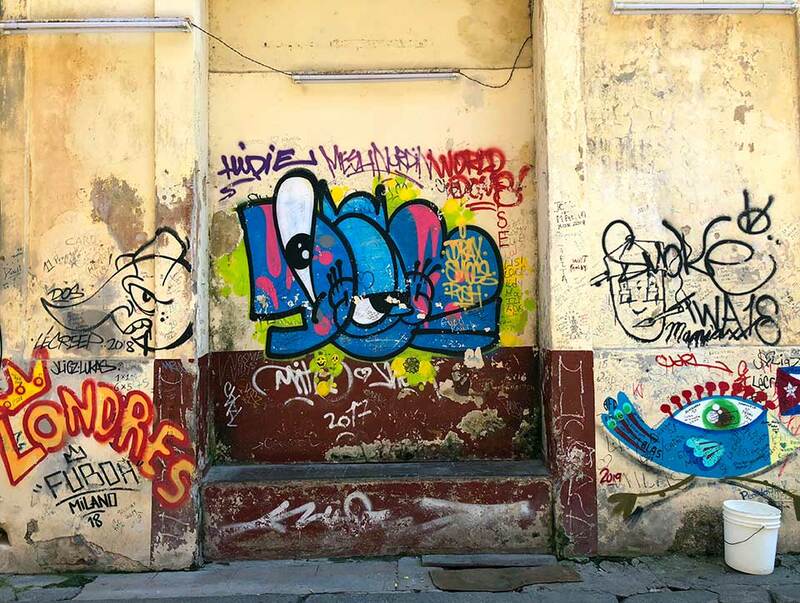 With its vibrant colors and classic colonial architecture in all states of repair, Cuba is lovely and dirty, gritty and artsy. 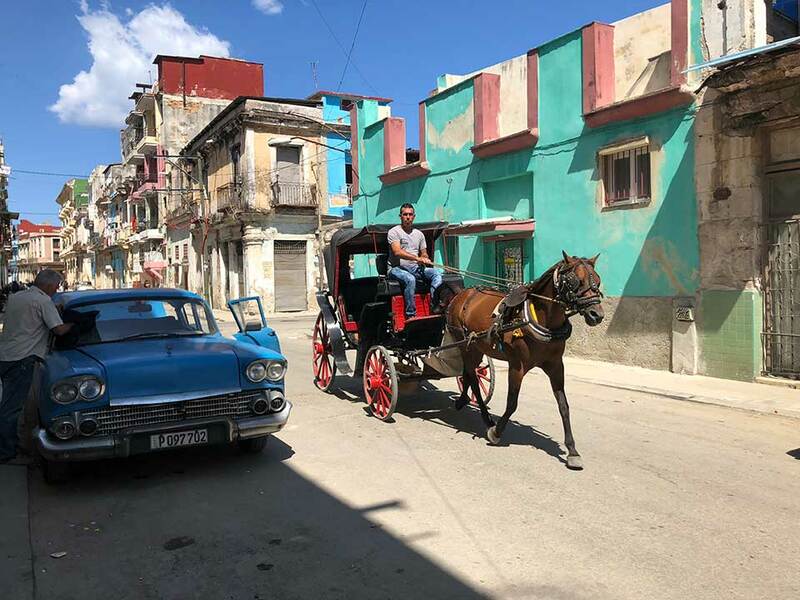 Cuba is an interesting mix of 1920's-30's Art Deco buildings and 1950s American cherry classic cars juxtaposed with horse-carts, 1970s-80's drab Soviet Union inspired block housing, and style-less Russian cars. 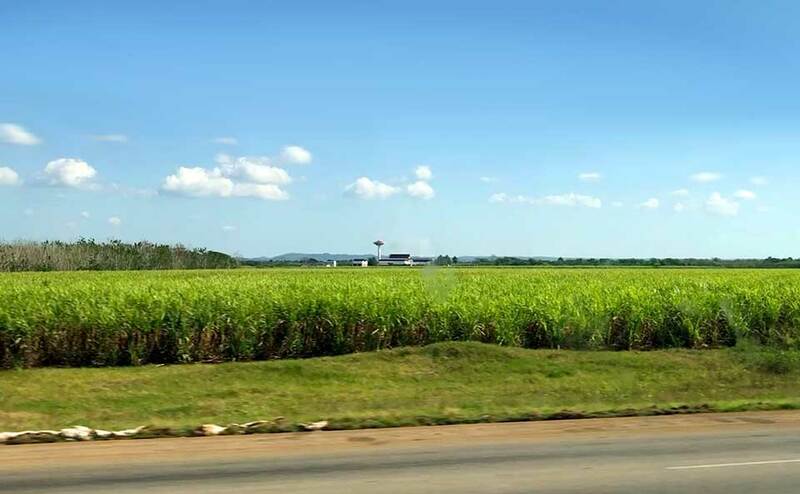 With 30-40% arable land devoid of crops due to poor sugarcane farming practices that have stripped the soils of nutrients, Cuba suffers from frequent food shortages. The beautiful Cuban people wait in line for hours to buy food from government run stores with next to nothing on the shelves.Cubans are a passionate people, fiercely proud of their island nation, if not their current regime (hummm... can any of you relate!?!) Cuba is complicated. So how did we come to visit this complicated Caribbean island nation? Early last fall our Seattle-area sailing friend Teresa signed on to captain one of three catamarans for a Cuba sailing charter in April. The group (loosely based out of Poulsbo Yacht Club) was originally going to be women only. And Teresa asked Heidi if she was interested in being her first mate? Of coarse Heidi jumped on this opportunity! Two friends of Teresa's, Val (a sailor from Orange County) and Kelly (Teresa's colleague in Seattle) also joined our crew and there was still room for a couple more. 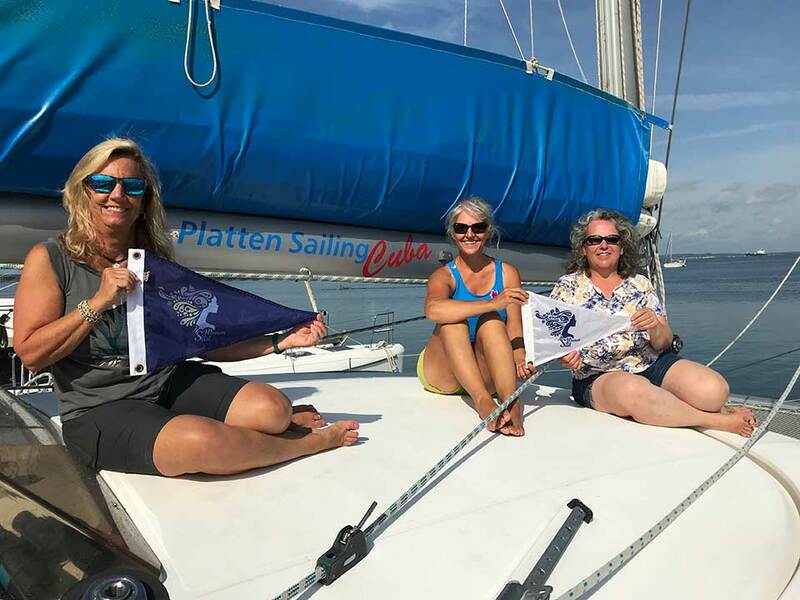 Women Who Sail Cuba! Valerie, Heidi, and Teresa with our WWS Burgees. Kirk was very supportive of Heidi doing this trip, although we were both a bit sad to not be discovering Cuba together. Cuba has always been at the top of our bucket list... whether it was the intrigue of being "forbidden" to Americans for so long, or that we we love Cuban music, Cuban food, colonial architecture, classic cars, and rum... or maybe it's just that it's one Caribbean island we hadn't yet visited... but we have always planned to sail Due West to Cuba. As it turned out, the organizers did not get enough women to fill the trip and it was opened up to men as well. Teresa let us know her husband Rob was joining us and that Kirk should join us too. Since we hadn't done much to celebrate our 25th wedding anniversary last year, we decided this trip would be the perfect once-in-a-lifetime anniversary gift! Plus it would be a great opportunity to recon for eventually sailing to Due West to Cuba. Our Salty Crew: Valerie, Rob, Kelly, Capitána Teresa, Heidi, and Kirk visiting Palacio de Valle in Cienfuegos. So our group of six started planning our trip with a flurry of emails. The sailboat charter was for one week, and we all wanted to stay longer and explore more of Cuba by land after our charter was over. 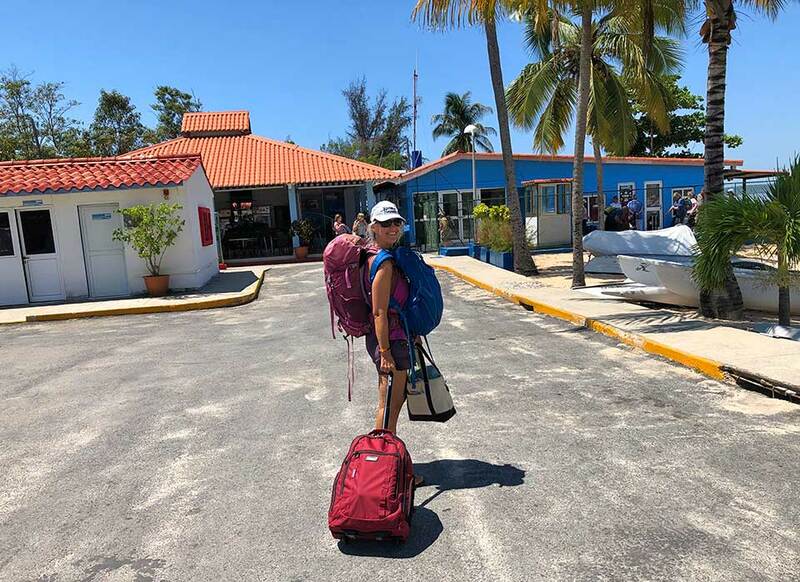 We had read about food shortages, so to ensure we didn't take much-needed food away from the local Cubans, we planned to bring a lot of our own food for the charter... reminiscent of when we rafted the Grand Canyon 15 years ago and brought all our own food for two weeks! Bel became our trusted tour guide and friend, sharing so much information about her lovely island nation. 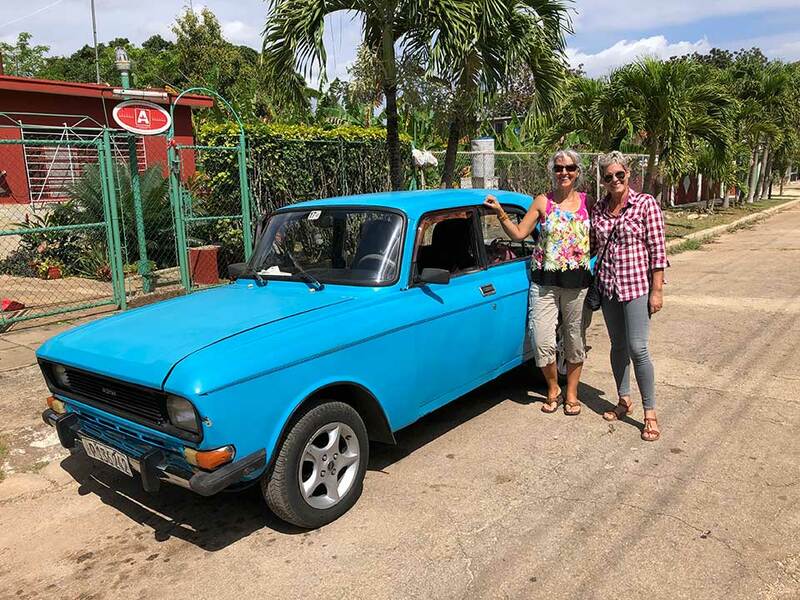 We had been given the contact information by friends of friends, for a Cuban woman named Bel, who could be a tour guide for us and help us with any thing we needed in Cuba. We started emailing with Bel in January, not knowing what the Cuban email was like or how long it might take to get a hold of her or organize our trip. Amazingly we got a return email the very next day with a whole itinerary and suggestions of things we could do, places to visit, and how she could help us. Little did we know then how integral Bel would become to our whole Cuban experience. We have all made a new lifelong friend. We were visiting under the category of "Support of the Cuban People", and planning everything on our own from afar (with the help of Bel on the ground in Cuba.) This was a much different type of trip than we've ever been on before, lots of pre-planning and organizing required to get all our ducks in a row before we left home. All six people in our group did a yeoman's job of recon and organizing things for the group effort. This included finding lodging, planning our meals onboard the boat and who was bringing what food, what we could bring to donate to the Cuban people, what type of currency we would bring, and how much to bring; plus pulling together a ton of music onto thumb drives as requested by Bel, who loves American rock music! We had read that you need to bring anything you may want while you're in Cuba, because things just aren't available there. And boy was that true! For example, we arrived a day before everyone else, and thought we would stop by a little neighborhood grocery and pick up some avocados and limes to make a guacamole snack for when the others arrived. Huh! Turns out here are no Mini-supers, 7-Elevens, or OXXO's in Cuba. And grocery stores as we know them, are rare to non-existent. We never saw one avocado in Cuba, nor much citrus fruit either, except tiny key limes which cost $1/each! (By comparison, in Mexico they cost 2 ¢ each.) There are no tortillas, totopos, or corn chips in Cuba. In fact there's not much junk food in Cuba at all. On the plus side, we never saw one overweight Cuban! You cannot even find the basics like shampoo, soap, or toothpaste in Cuba. However rum and bottled water are available everywhere, for a price. 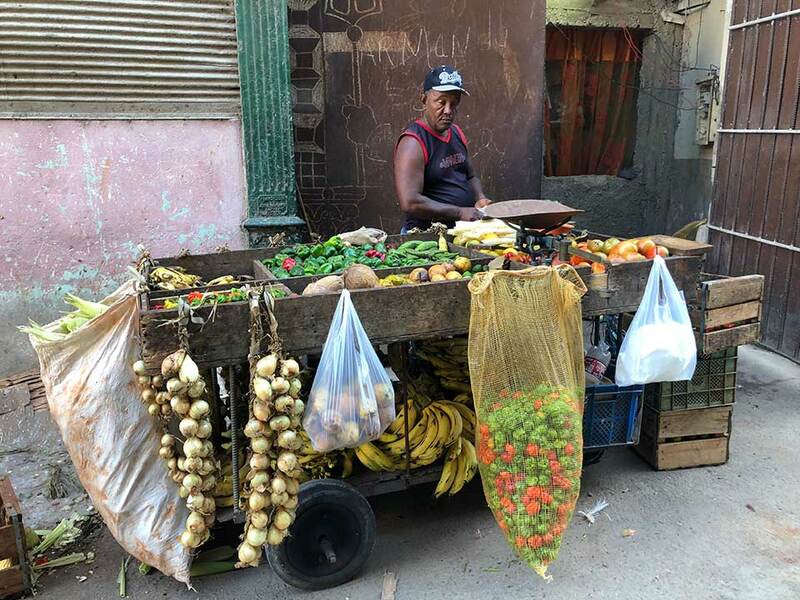 It's complicated, but somehow the Cubans have the system down and seem to manage OK.
Cuban produce mostly consists of garlic, onions, plantains, cucumbers, potatoes, peppers, cassava root, sweet potato, cabbage, papaya, pineapple, mango, and tiny bananas. Prior to our trip, we read a fascinating book, "Cuba Conga", which starts where Lonely Planet ends. It explains the ins and outs of Cuban life, culture and the bolsa negra (the black market), or how things really work in Cuba. 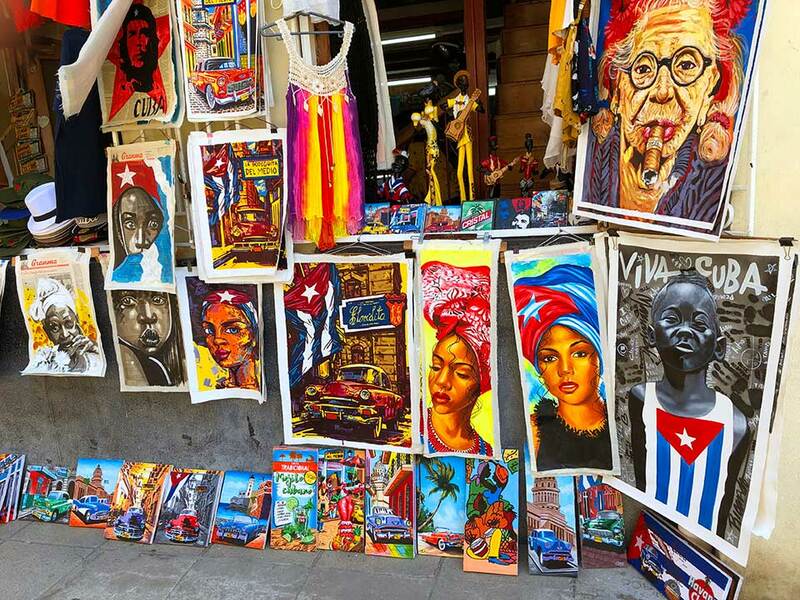 It's aimed at helping tourists get the most out of their Cuban experience, while not getting hustled. For example, when a "jintero" (street con or opportunist) says "Hey my frien, where you from?" You should answer "La Lisa!" 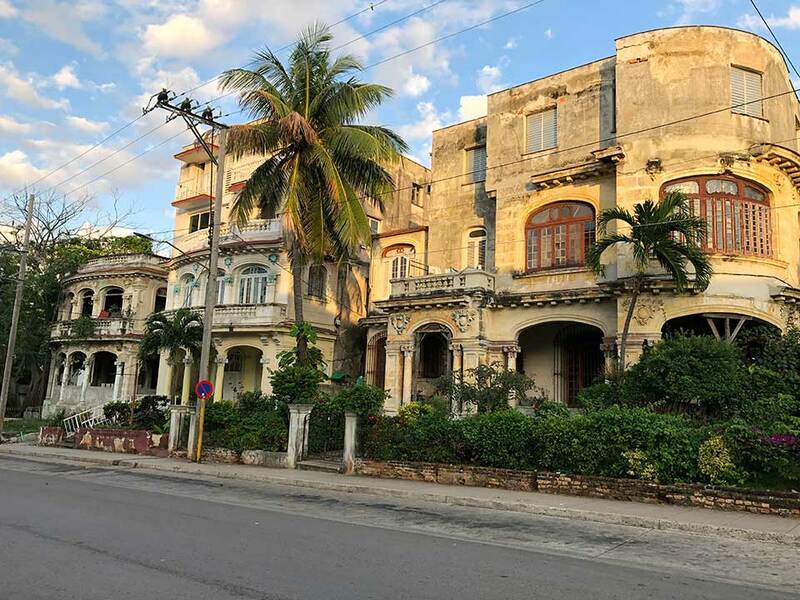 La Lisa is the baddest neighborhood in Havana, and with that answer they get a big laugh, know you're on to their scam, and move on to their next tourist. They mean no harm, they are just trying to make a living. Life in Cuba is complicated. But it's also very safe. There are no guns, and Cubans can go to jail if harm comes to any tourist. Cuba has two monetary systems, one for the tourists, the Cuban Convertible Pesos (CUCs), and one for the gente (Moneda National.) The CUC is valued 1-to-1 with the $US dollar. The Moneda National is 25-to-1 CUC. The average doctor, lawyer and other professionals earn the equivalent of $30-$40 US per MONTH. Other jobs like Street Sweepers (responsible for cleaning 2 city blocks with a government issued broom/shovel every day) make much less than that. 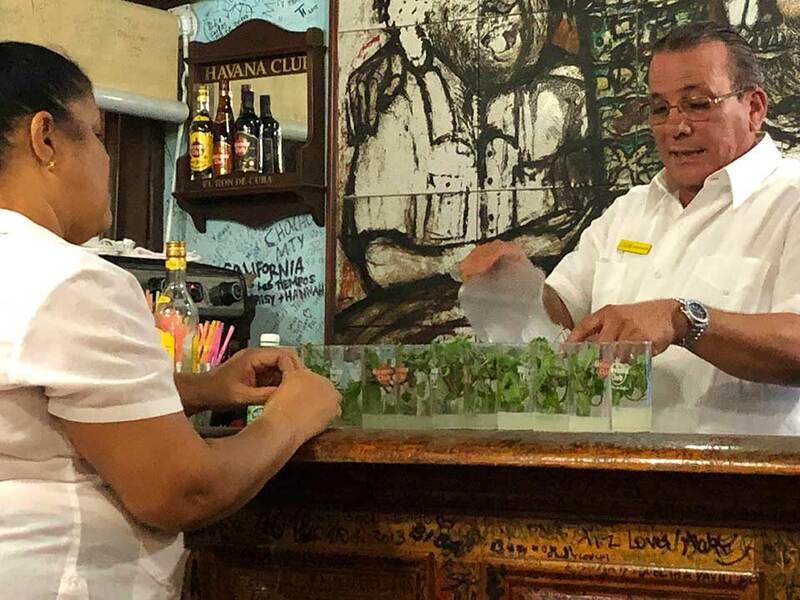 Most Cubans have at least two jobs, their official government job, and their side hustle "bolsa-negra" job, where they actually earn a living. We had read that Internet was nonexistent for American phones. So we had all planned to unplug for two weeks, downloading Maps.me ahead of time and any other apps that would be useful for our travels, yet not requiring Internet to use them. This did not turn out to be true, and we did have a bit of Wi-Fi service, but like everything else in Cuba, it's complicated. There are a few Wifi hot-spots around most cities/towns, and some Casa Particulares have Wifi as well. This just means that there is the opportunity to connect to the internet in these places, you're not actually connected until you buy a Wifi Card (about $1 per hour, in 1/2-hr, 1hr, 3hr, or 5hr increments.) The Wifi Card is kind of like a lottery card. It contains a user name, and you then scratch off the password, enter both on screen when requested, and you have access to some very low-bandwidth internet. Cards can be shared by multiple people, and the meter stops running when everyone logs out. So this enables you to use it for small bits of time to check email, then turn it off and save your card for next time. After months of planning it was finally time to head to Cuba! We were scheduled to arrive at 11:30 PM on a Friday night, the rest of the group arriving Saturday and Sunday. Just over Havana and ready to land the pilot came on to announce that the Havana airport had temporarily closed and we would be circling.... for an hour. We finally landed at 12:30 AM and by the time we got through customs (a chilly militaristic reception) it was almost 1:30 AM. Entry into Cuba was interesting - we were directed through Immigration one at a time, not as couples or families like most airports do. Our photo was taken, compared to our passport, and then we were watched as we went through the exit gate until it closed behind us. And it was the next person's turn. Meanwhile once through the exit gate, we went through metal detectors and all of our carry-on luggage was x-rayed. This was before we even collected our checked bags. We'd never gone through that type of security upon landing, it was the same process as departing elsewhere in the world. We had chosen a casa particular for one night right near the airport, due to our late arrival time. The Casa had told us to call them when we had our bags and were ready for pick up. The problem is US phones don't work in Cuba so we were wondering how to make the call? Thankfully there was an information desk with a nice woman who offered to make the call for us. She informed us that a "woman with yellow hair would be arriving in a blue car." As we exited the terminal Kirk went to exchange euros into Cuban Convertible Pesos (CUCs) and yes, the Cambio Exchange was actually open at 1:30am!? Heidi waited by the curb for a "blue car with a yellow haired woman." Ironically every car that drove up for the next 15 minutes was blue!?! But none of them had women drivers. Finally Dayari arrived in a 1970's blue Russian Lada-like car, complete with exhaust leak. She was a friend of our Casa Particular owner, and welcomed us with hugs and "Bienvedos a Cuba!" Our casa particular was in the suburbs outside of Havana. A nice stay at Hostal Aeropuerto. The proprietors were a Cuban woman with an Italian husband. Apparently he makes excellent Italian dinners, but we were only there one night and arrived too late for dinner. 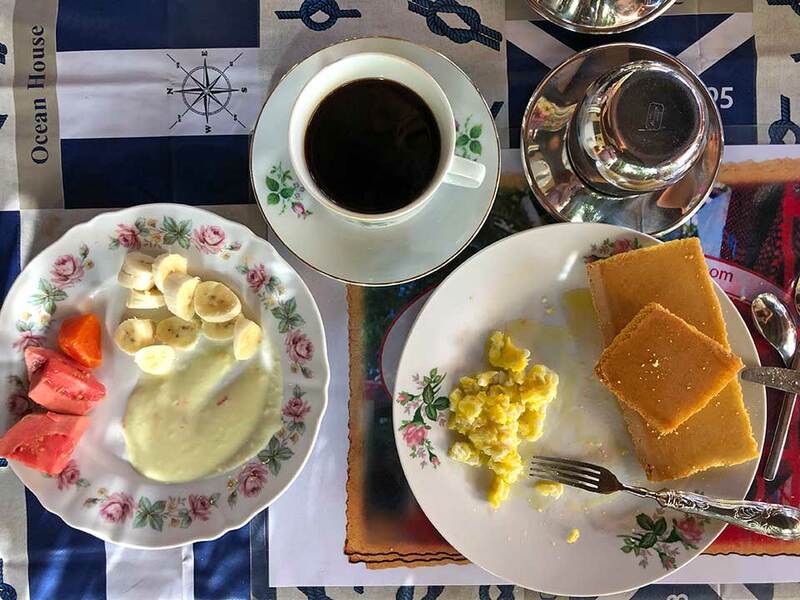 A typical Cuban "tourist" breakfast consists of: yogurt, eggs, bread, fresh tropical fruit, coffee, juice, and milk. All things that Heidi can't eat (food allergies!) but thankfully we planned ahead and brought lots of organic, complete-meal protein and energy bars that she ate for breakfast every day. 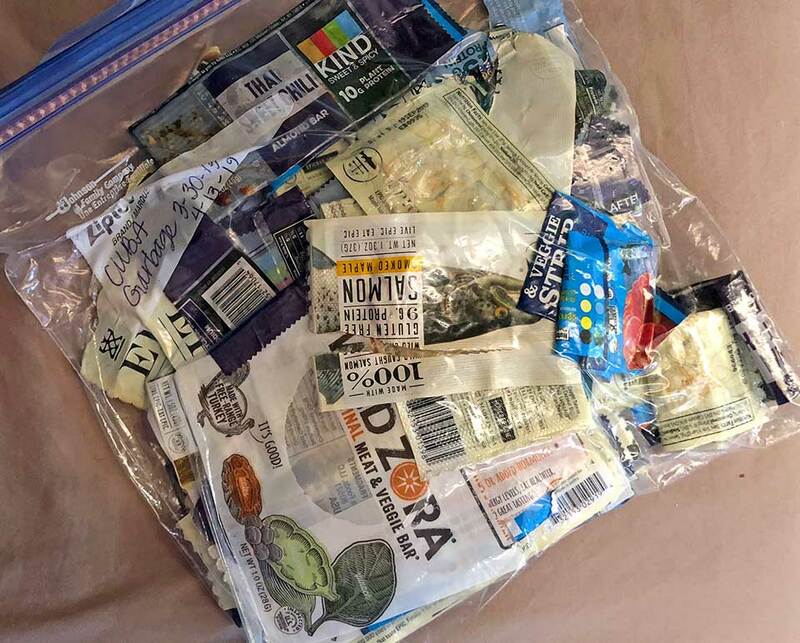 We also saved every single wrapper and brought them all back to with us, not wanting to add our packaged food wrappers to this lovely island's trash. There's a huge niche needing to be filled: biodegradable food wrappers for all of the organic, whole-food, protein and energy bars being sold at natural food stores. Eating healthy is only really "healthy" if you're not polluting the planet in the process. After breakfast Dayari picked us up again to drive us into Havana and our next casa particular where we'd stay with our group for a few days. Everything was so new and different driving into Havana, and so photogenic we could not stop taking pictures! As the first to arrive in Havana we checked into our next Casa Particular. Just like with Air B&Bs, sometimes a Casa Particular is a whole house, sometimes it's a room or two in a house. Cubans are only allowed to own one house. If each person in a couple owns their own house prior to getting married, they can keep both houses, one in each name. This enables them to use one casa as a Casa Particular, or as a store, or restaurant. Otherwise, most stores, restaurants, and hotels are owned by the government. It was very common to see someone's living room opened up as a little store-front. Here their end table doubles as a cigarette stand. This house was down the street from our first Casa Particular in Havana, and similar to where we stayed, although the one we were in was in a lot better state of repair. 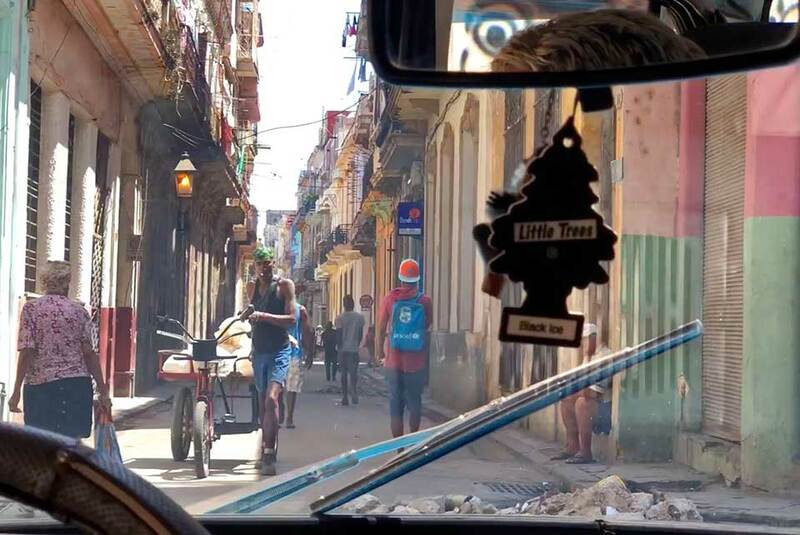 Bel's first Havana Tip was to ALWAYS walk IN the street, NOT on the sidewalks. This is because the old buildings are notorious for crumbling apart, and chunks of concrete balcony can fall at any time. As you can see in this photo... it could easily happen. 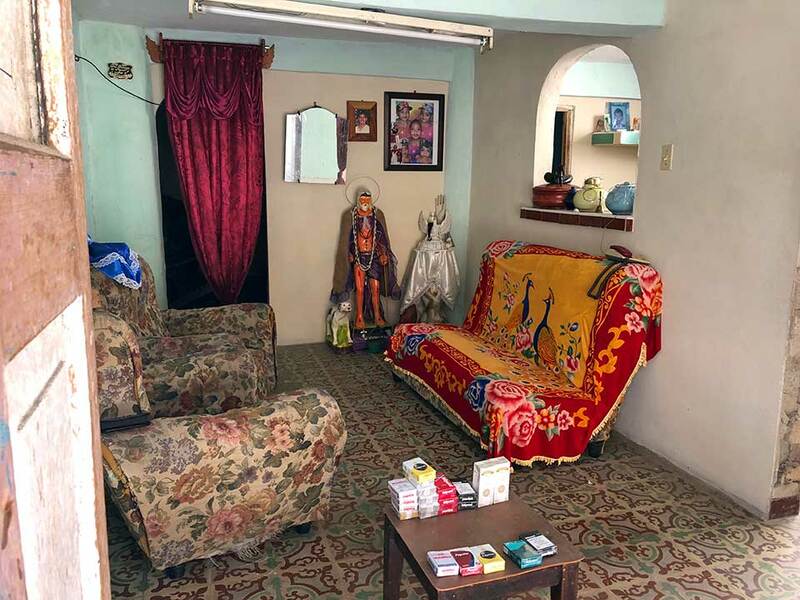 Up a long, steep flight of narrow stairs, our nice, clean Casa Particular in Havana was a whole two-story apartment with 4 bedrooms, 1 little bathroom, and tiny balcony with French doors. Presumably the owners lived in another house, we never met them. Maria, the next door neighbor, also cleaned the casa and came in at 7:30am each morning to make breakfast. 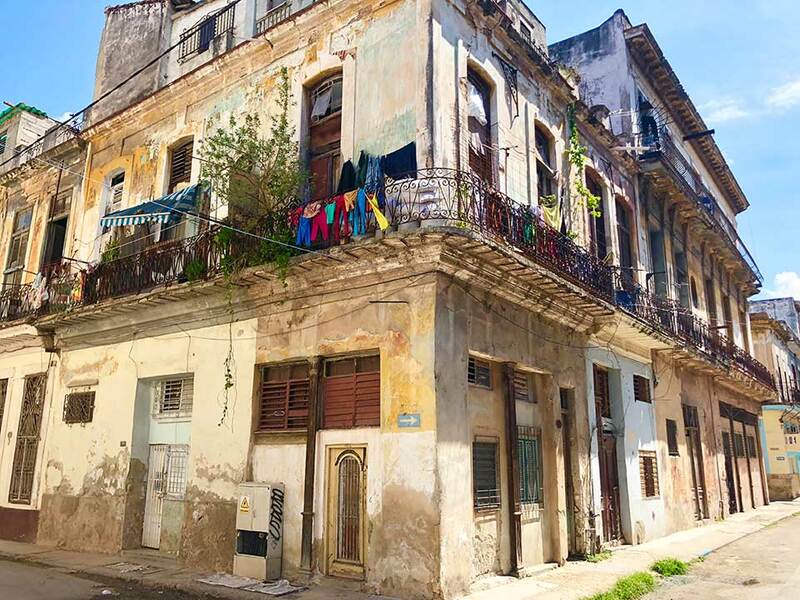 The neighborhood was a non-touristy, working-class neighborhood near Old Havana. Cuba is NOISY, and people just get going with their nights around 11pm when we were headed to bed. Dogs barking, people talking and shouting to each other across the streets, heavy equipment machinery working at night, including water and propane deliveries at ALL hours of the night (12am, 1am, it doesn't matter...when you're out of water or gas, they come fill you up, and the pump sounds like a jackhammer!) Crazy... but that's Cuba. It's complicated! Bel was waiting for us at the Casa. We immediately felt like old friends after all the emails we'd shared, planning our trip. She is the same age as Heidi, and it was very interesting to hear tales of her life growing up in Cuba, juxtaposed to Heidi's life growing up in Wyoming, worlds apart. 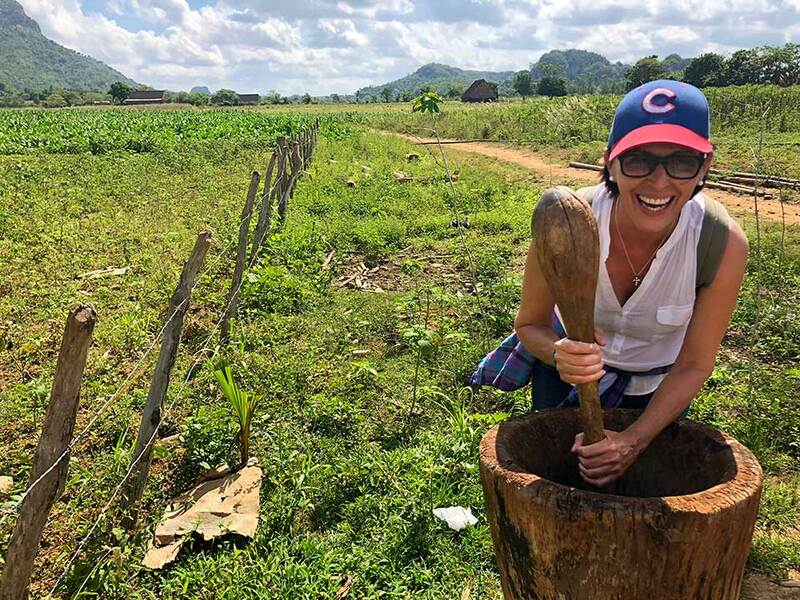 Bel is an English Professor at University, in the Tourism Department helping local Cubans in the hospitality industry to improve their English, whether they work in bars, restaurants, hotels, or as tour guides. 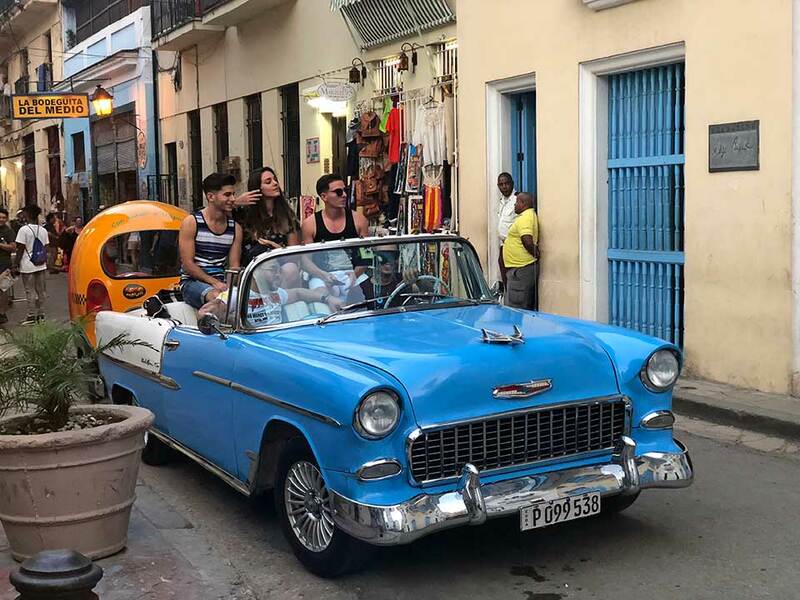 Tourism is a growing business in Cuba, and although Americans had been "forbidden" to visit since after the Revolution in 1959, Canadians and Europeans have been vacationing in Cuba all along. In 2016 President Obama was the first American president to visit Cuba in 88-years, opening things up for Americans to once again travel to Cuba. 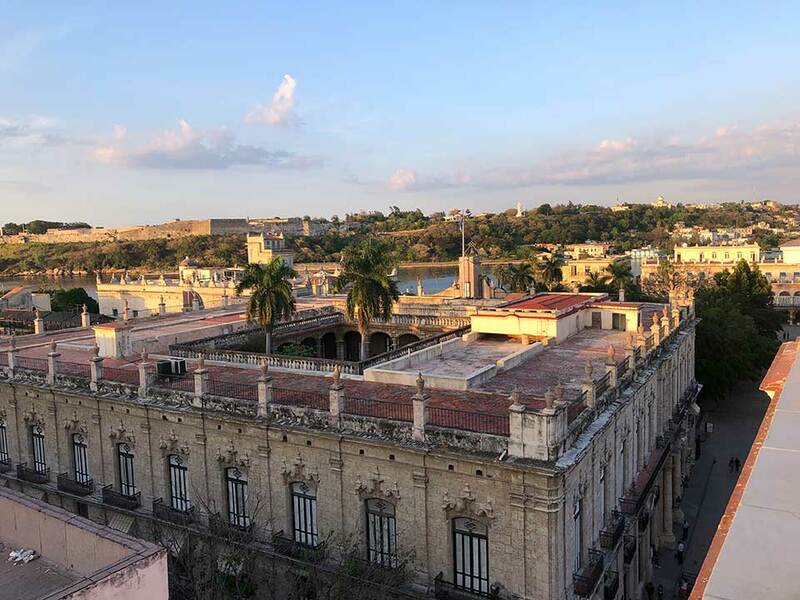 Sadly in the past week (since our return), the current US administration is threatening to slam the door on Cuba again, making it more difficult for Americans to travel there. 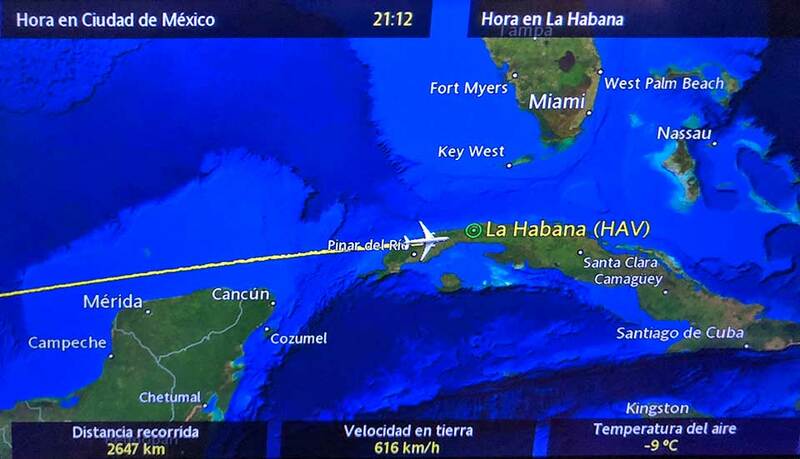 However even if US airlines stop flying to Cuba, it is still possible to fly in from another country like Mexico or Canada. In general it seemed like Cubans love Americans and American culture, and understand that individual Americans are not to blame for our government's embargo. 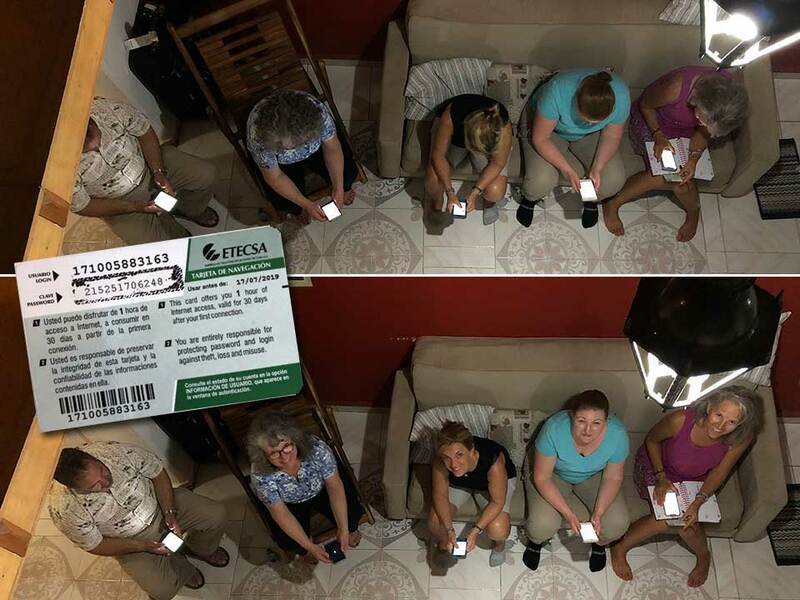 The "panorama" feature of the camera put a curve in this photo which is actually a flat wall mural. It is made entirely of crushed stones of various colors, mixed with epoxy, see inset. No paint was used. 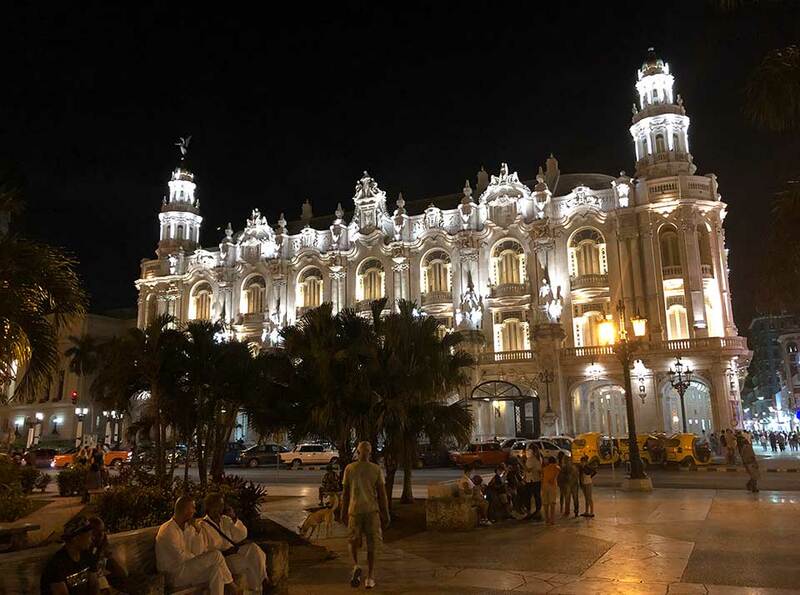 It's also a mirror image of the building across the street from it, which was an important historical building and the people in the stone "painting" are all important figures from Cuba's past history. 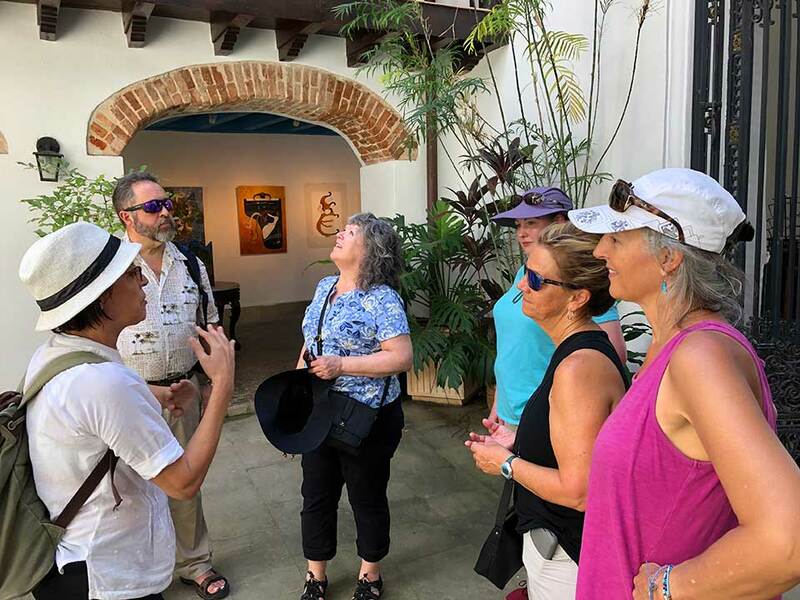 Bel took us on a walking tour of Old Havana where we learned a lot about Cuban culture and their Spanish History from Columbus through the 1800's, saw old forts, the cathedral, and other colonial merchant buildings. We also saw lots of art, everywhere you looked, from graffiti to people selling paintings on the street. Teresa & Rob were supposed to arrive that afternoon but had not showed up. Thankfully Dayria had giving us a 30-minute wifi-card to use, and we were able to briefly connect using a wifi hotspot, to find out their flight had been canceled and they'd be arriving in the morning with Kelly and Val. So we checked out La Bodegita del Medio for dinner that night. If you're not familiar, it's a Cuban restaurant chain that Hemingway made famous. "My mojitos at Bodegita, my daiquiris at Floridita." There are none in the US of course, but they are all over Mexico, Central and South America, and Eastern Europe. 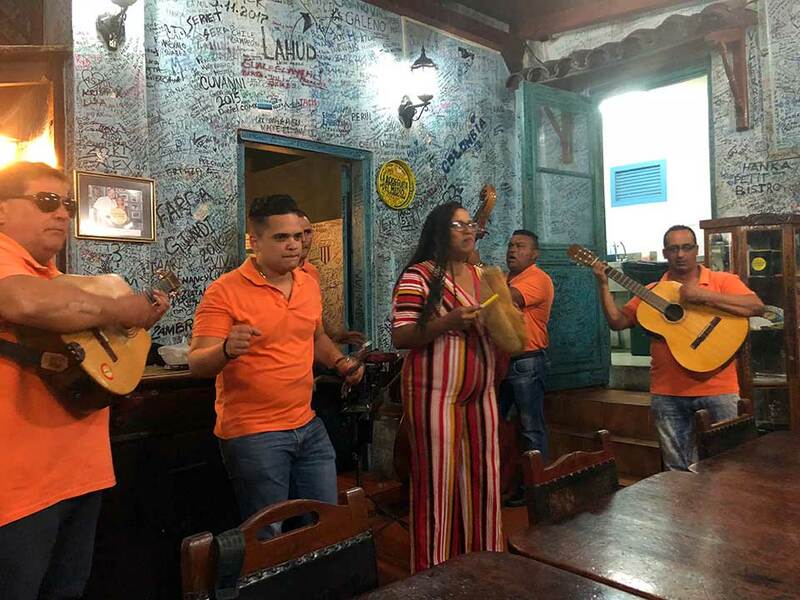 We love the one in Puerto Vallarta, which has excellent Cuban food, mojitos, and nightly live Cuban music. 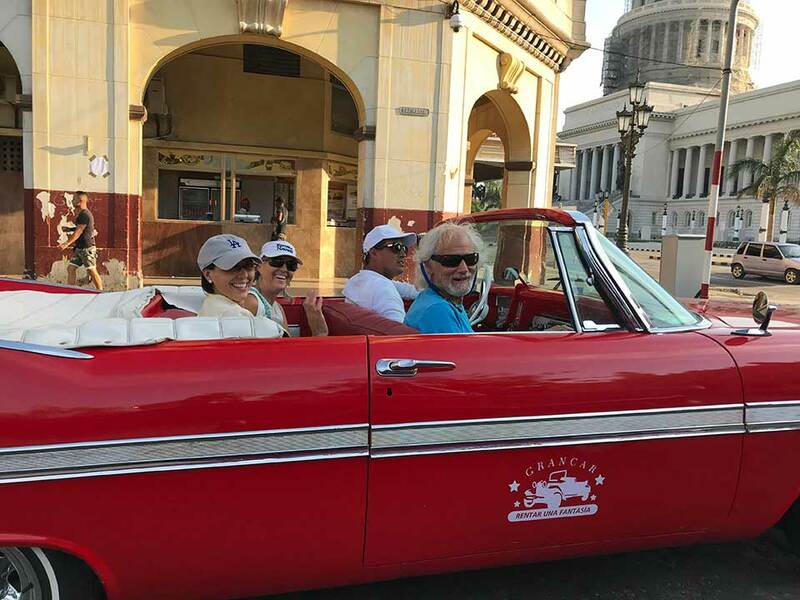 So we were excited to visit the original in Havana to see what it was like. Sadly, it's very touristy, with expensive, weak Mojitos, and a very limited menu. However the Cuban music was fantastic. The next day the rest of our group arrived and we hit the ground running. With Bel in the lead, and one day left to explore Havana before heading south for our Sailboat Charter, we saw and did a lot! 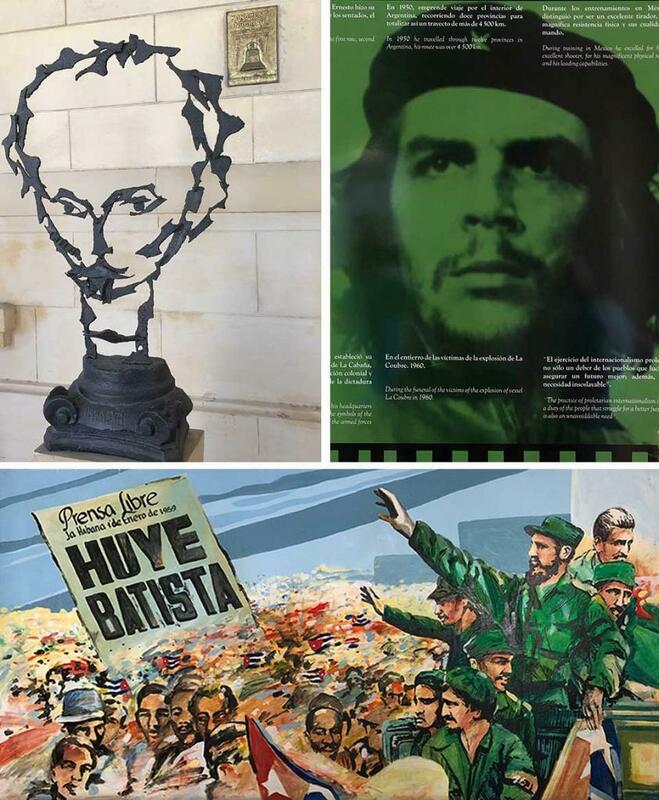 From the Revolution Museum (where we learned a lot more about Cuban History); to a Classic Car Tour through formerly wealthy neighborhoods from the Sugar Barron days, reminiscent of old Miami; to a ferry ride across Havana Harbor to the other side of town where we visited the "Church of the Sailors", we were go-go-go. We stopped for a delicious lunch at La Farmacia, where the wait staff dressed like pharmacists, and the "medicine" mojitos were delish! Mojitos anyone?! Because limes are so precious in Cuba, most Mojitos we had in Cuba did not have a lime garnish.. The Revolution Museum: (top left) José Martí, a 19th Century Cuban poet, essayist, journalist, translator, professor, and publisher, who is considered a national hero and an important figure in Latin American literature; (top right) Ernesto Ché Guevera, a major figure of the 1959 Cuban Revolution, whose stylized image has become a ubiquitous countercultural symbol of rebellion and global insignia in popular culture; (bottom) a 1959 propaganda poster of Fidel Castro overthrowing dictator Batista. 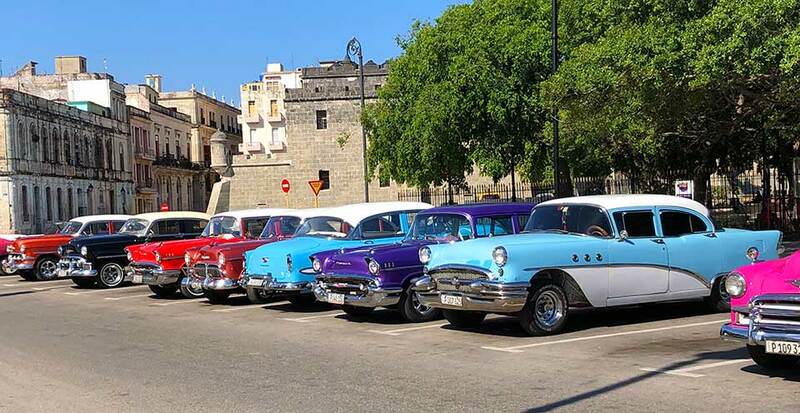 After taking pedi-cabs to the Crafts Market which turned out to be closed that day, Bel suggested we hop a ferry boat across Havana Harbor to visit the area where slave ships arrived and offloaded West African slaves for for the Cuban sugar trade for almost 400 years. Here we also visited Iglesia de Nuestra Señnora de Regla, or the church of the Black Virgin. Senora de Regla, (quite likely a conglomeration of an African Yoruba goddess and a Christian saint), has been the patron saint of sailors and seagoing voyagers for hundreds of years. Not being at all religious, but realizing that we were a group of sailors headed off on a 70-mile sea-going voyage the very next day, we lit a blue candle and asked for fair winds. When in Rome... er, uh, Cuba! Note the ships Anchor at the top of the ceiling. 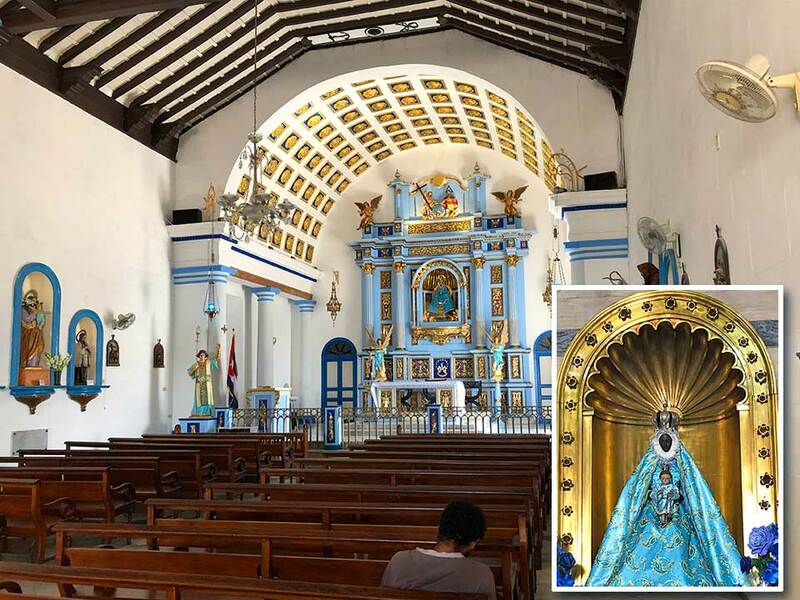 Although Cuba is predominantly Catholic, there are a growing number who practice Santeria. Santeria began during the slave-era when slaves were forced by the Spaniards to become Catholic. The slaves would super-impose their traditional Yoruba gods and goddesses onto Catholic saints. Today, the Santeria still attend Catholic services, but also have their own practices that some say are akin to Voodoo. Initially we weren't interested in the "touristy" idea of a Classic Car Tour. But Heidi's brother Arne and his wife Teresa recently returned from Cuba and said it was cool, and Bel really encouraged it too. And after all the walking that day, it would be nice to sit for a bit. So we decided to ride in two convertibles to celebrate the warm weather and great views of Havana. It was great fun, and gave us a chance to visit other Havana neighborhoods beyond our walking tours. Val took this photo of Bel, Heidi, driver Rydell, and Capitan Kirk riding shotgun. Rydell is the driver for an old woman who owns the car. She pays for maintaining it and he does the maintenance work and drives it, and takes it home each night. Although the car logo and Rydell said it was a Doge, Kirk-the-car-guy says "no way." Kirk says it must be a Canadian Plymouth, not a version that was ever manufactured in the US. He would know! The National Theater is a beautiful building in the daytime, and even more so at night. This is the home of the famous Havana Ballet. We'd hoped to take in a performance, but timing wasn't right. 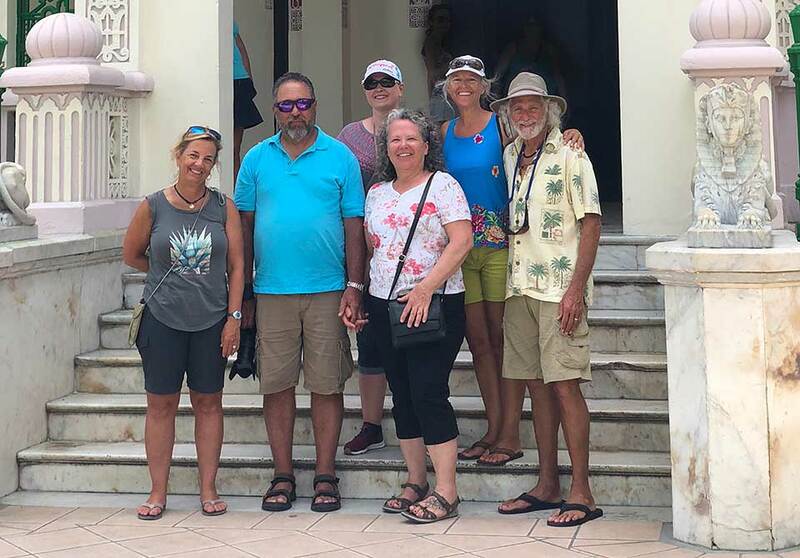 The next morning we had arranged to meet up with the rest of the sailors from the other two charter boats and all take a private bus for three hours to the charter base in Cienfuegos. Bel had graciously coordinated with the bus driver on our behalf, to ensure that he could pick us up at our Casa Particular, so that we wouldn't have to schlep all of our luggage 9-blocks away where the others were staying. As it turned out, our particular narrow street was blocked by a cherry-picker lift machine that morning and the bus couldn't get anywhere near us. It's Cuba, it's complicated! 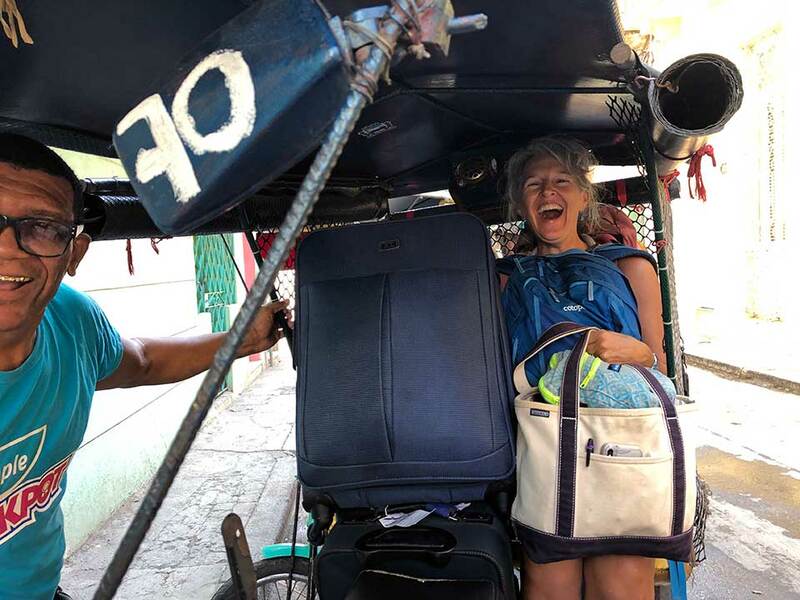 Ever resourceful Bel grabbed two pedi cabs and loaded up all of the luggage with Val and Heidi each riding along to ensure nothing fell out. The rest of the group hoofed it about five blocks away where we all met up again at the tour bus. We bid farewell to Bel for a week, all felling like we were saying goodbye to a good friend. She and a taxi driver friend of hers would meet up with us again in Cienfuegos after our sailing adventures. 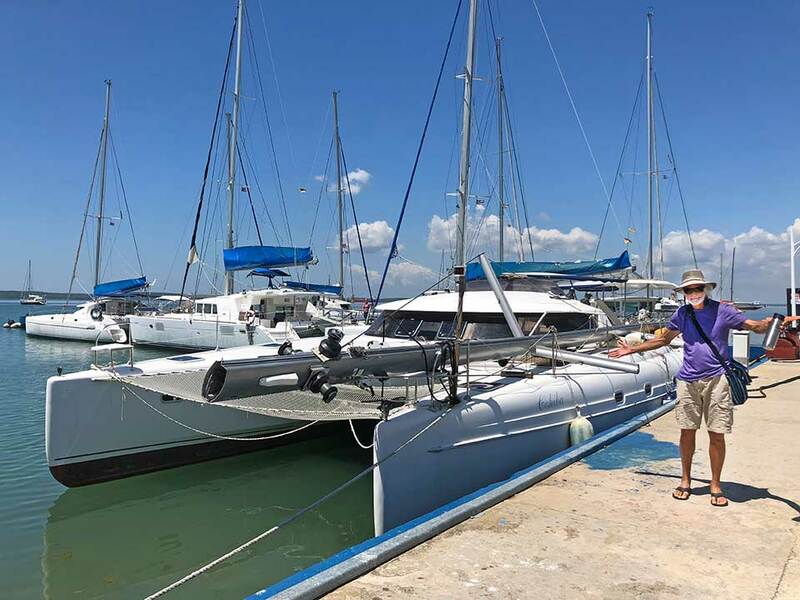 Although our sailing charter was baed out of Cienfuegos, about 3-hours south of Havana, Hemingway Marina in Havana is a famous marina to many sailors and we wanted to check it out. 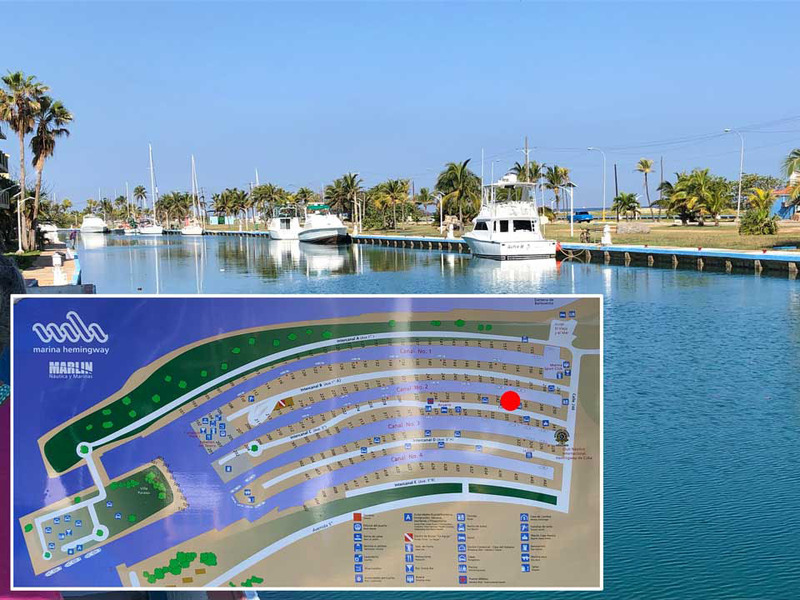 Unlike most marinas, this one consists of four parallel canals, each ¼-mile long, with side-ties on both sides. Most cruising sailors visiting Cuba will check-in here. Another interesting thing we learned about Cuba is that most Cubans are not allowed on or around boats with engines, not even on docks. Those who work on charter boats, work boats, or fishermen have special government permits. And most fishing boats have very small 1-cylinder, 5HP put-put inboards. Presumably it's to keep them from fleeing to the US, only 90-miles away? But we all felt it's a sad state of affairs to live on an island and not be able to boat. From Havana to Cienfuegos, sugarcane fields extend as far as the eye can see... running alongside 4-lane highways with virtually no vehicles... maybe an occasional horse cart, or motorcycle, a car now and then, or a tractor, it was one of the most empty highways we've ever been on. For over 400 years Cuba was the King of Sugar. In 1820 they produced 400,000 tons of sugar annually, with 90% of that exported. By 1925, a hundred years later, they were producing 5-million tons of sugar annually, thanks in part to WWI and keeping the soldiers high on sugar. Beginning in 1898, the US had their fingers in the sugar-jar, and not in a beneficial way for Cuba... after the Cuban Revolution, US embargo, and collapse of the USSR, the Cuban sugar industry was dealt a big blow. Throughout time sugar prices have fluctuated wildly. In its heyday in the late 1980's Cuba exported more than $5.5 billion in sugar. By 2007 annual sugar production had decreased to 1.2-million tons. And after much recent damage by hurricane Irma, this year they are expected to export about 1-million tons. Raw Sugar is still the top dollar export of Cuba, followed by Rolled Tobacco, Nickel Mattes, Rum, Shrimp and Lobster. 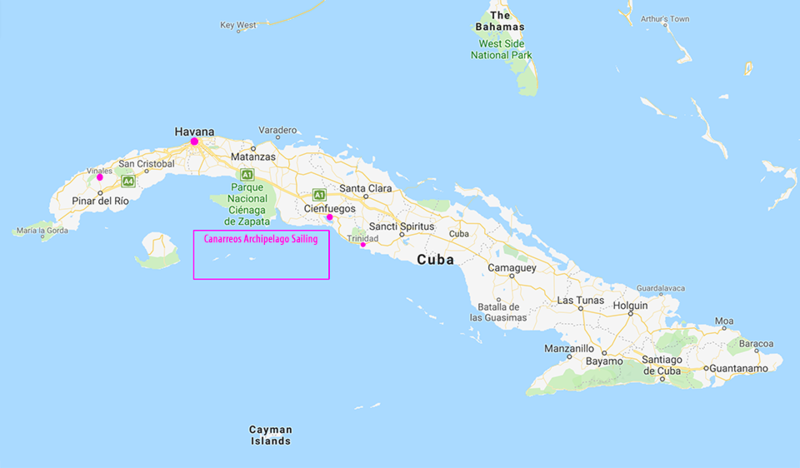 We'd be picking up our charter catamaran in Cienfuegos, then doing a night passage out of Cienfuegos Bay to the Canarreos Archipelago, 70-miles away. What you don't see in this photo: the GIANT duffle bag full of food we brought with us for the sailing portion of this Caribbean vacation! Forgot to get a photo of that, lol. Because we'd be sailing 70-miles off-shore, it also contained 3 PFDs and harnesses which thankfully arrived in Cuba just fine. Members of the other boats had their C02 cylinders confiscated by TSA or the airlines in the US. TSAs own website contradicts on if you can/can't bring C02 cartridges in checked luggage, one page says you can the other page says you can't. It's complicated... in the US! Stay tuned for the rest of our Cuban Adventures here next week! In the mean time be sure to check out the photo gallery with lots more photos of Havana. Due West's Photos - ¡La Vida es Chula!